On March the 29th, our CEO Patrick Benichou was part of the delegation that accompanied French President François Hollande during his official visit to Indonesia. Along with other entrepreneurs, Patrick Benichou participated to several events dedicated to promote French industry in Asia. 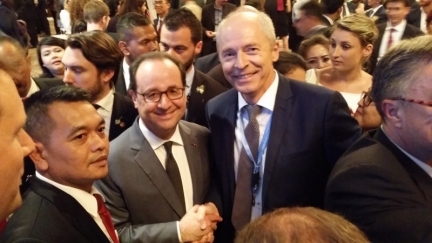 François Hollande's support to MFI's strong partnership with BMKG (Indonesian national met service) is both a sign of confidence and also an acknowledgement of the importance of meteorological projects for meeting the challenge of climate change.